Experience the mid-winter in Lapland! Travel with your own team of Siberian huskies through the fairytale forests and see the mysterious northern lights slowly dancing over the sky. We will pick you up in Jokkmokk and drive you to our kennel, located just outside Jokkmokk. Here those who need get dressed in warm thermo parkas and pants and boots. 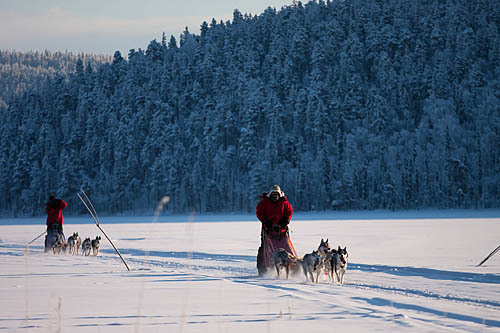 You will learn how to handle a dog sled, how to communicate with the huskies and learn about safety in cold climate etc. We harness the sled dogs and pack the sleds and get ready for start. You will drive your own team with 4 Siberian huskies. On day four we head back to Jokkmokk and will arrive to the kennel in the afternoon full of new experiences. We give the dogs some snack and take off the harnesses. After saying goodbye to your new friends we drive you back to Jokkmokk. Minimum 2 persons maximum 5 persons. We recommend that you arrive to Jokkmokk the day before the tour starts so you don't risk to miss the tour if your flight/train etc. should be delayed. All activities are mostly moderate. In wilderness cabin we sleep on bunk beds in mixed room with both gentlemen’s and women’s. The wilderness cabins are heated with wood/gas and have no electricity or running water. In tent we have a wood stove and sleep on reindeer skins in warm sleeping bags in the same tent. Dry toilets are available at the cabins but at the tent camp we dig holes in the snow. If you are unsure if you are able to take part don’t hesitate to send us an email and tell us about yourself and your worries. Women seem to underestimate them self very often, while men sometimes overestimate their own physical capacity. On our tours, we have people from all over the world of all genders and ages up to 70 years old. Minimum age is 16 years old (in company by an adult) to follow on this tour. required of you as a participant.